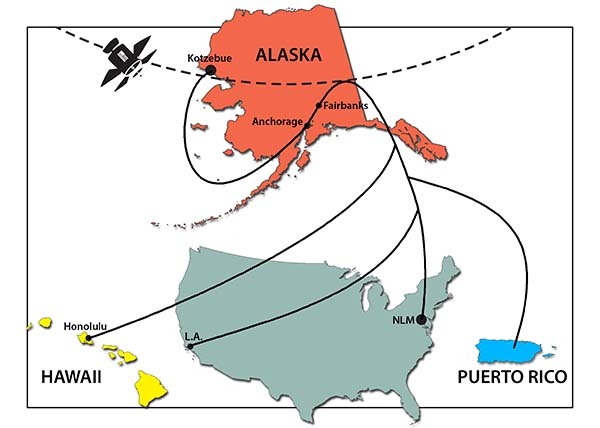 NLM’s long distance learning stretches north, south, east and west. “Hey, Alaska. Welcome to the United States,” said a high school student in Los Angeles to a student in Alaska. “Welcome to the other half,” quipped the Alaskan student. Cultural sensitivity and geography lessons are just a couple of extras to come out of NLM’s Distance Learning Outreach Program. What started as a “what if we could bring health and science information to more students with diverse backgrounds” grew into an NLM program that simultaneously teaches students at four high schools in four different time zones and in four different geographic areas. Experts share advice, research, and enthusiasm for studying everything from AIDS to Zika to medical careers to advice for healthful living and more. The windowless room that was once a showroom for NLM interactive technology is now command central for the Distance Learning Program. Large monitors show multiple classrooms and a camera sits atop a Girl Scout cookie box. This is where the Lister Hill Center’s Craig Locatis, PhD, long distance learning expert, and Specialized Information Services’ Cynthia Gaines, outreach specialist, will do whatever it takes to coordinate the Distance Learning Outreach Program. Every school has different bell cycles, starting and ending times, and time off for holidays, teacher training, tests, and proms. Some students are taking basic science. Others are in Advance Placement science classes. The reality is that everyone has to be flexible. Back in 2004, when Gaines and Locatis wanted to expand the Library’s outreach to minority students, they didn’t know how far that reach could or would go. The pair knew how much planning, coordination, and energy it took to work with high school students. They also knew how rewarding it was. Through the Library’s adopt-a-school program, NLM staff had hosted local high school students since the 1980s. They had stories about students returning to NIH for research or to work. In 2004, there was just enough technology in place to try videoconferencing for instruction and maybe more importantly, for questions answered in real time. “It was very iffy at the time,” recalled Locatis. They were willing to try. They approached King Drew Magnet High School of Medicine and Science in Los Angeles, one of only a few high schools in the country that focused on medical education. An affiliation with the Charles R. Drew University of Medicine and Science was key. The university was a partner and next-door neighbor of the high school and had an auditorium that could accommodate videoconferencing. They had one hour available per week on a Friday morning. Would it work? The only teacher who volunteered to participate had a class at the exact time the conference room was available. Although the school’s administration was supportive, only one teacher participated at first. That would change. The program was a hit. More teachers wanted in on the action. Fortunately, their classes could join via a network connecting the high school to the university. Coincidentally, that was part of an NLM-funded telemedicine study, which extended access to multiple classrooms. Students no longer need to be walk over to the university. They could participate from their own classrooms. 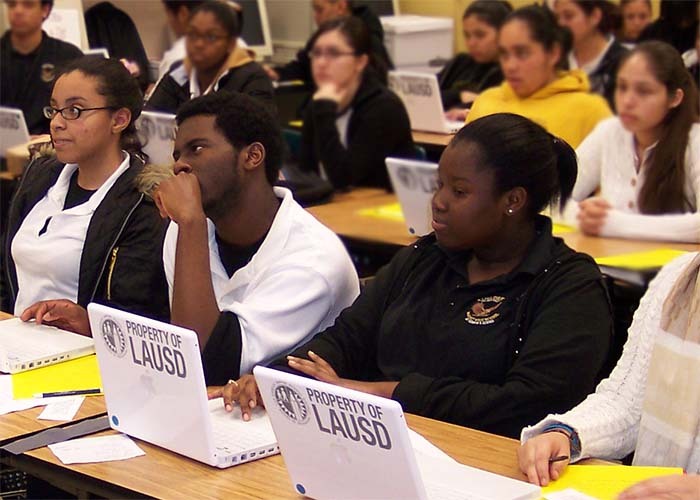 Students at King Drew Magnet High School of Medicine and Science in Los Angeles participate in long distance learning through NLM. 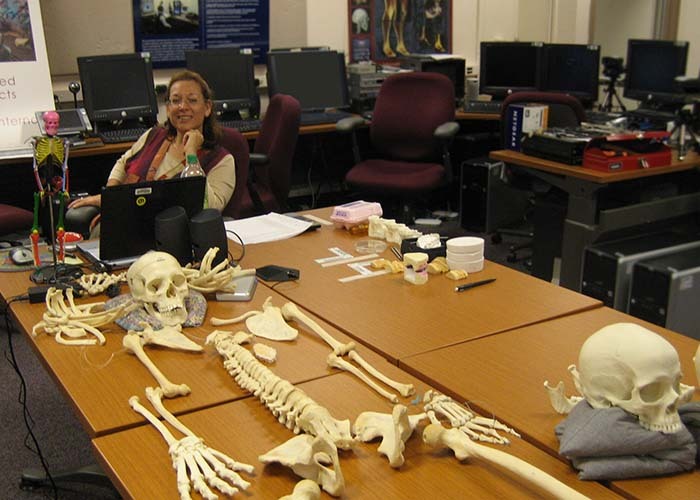 High school science teacher Dorothy Harris busts myths about forensic science seen on television. NLM’s Cynthia Gaines and Craig Locatis meet with staff at the Papa Ola Lokahi Native Hawaiian Health Organization who help identify Native Hawaiian health professionals to make presentations. 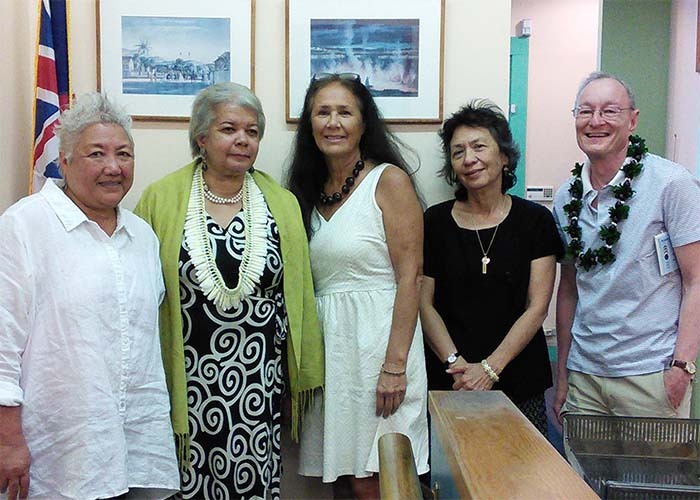 From left to right: Mei-Ling Isaacs, a project administrator; Cynthia Gaines; Momi Fernandez, a project administrator; Sharlene Chun-Lum, executive director; and Craig Locatis. A few years later when NLM’s Outreach and Special Populations Branch wanted to include Native American students, Gaines and Locatis consulted with Native American physicians, who suggested a school in Kotzebue, Alaska, located in an area with a high turnover rate for health care providers. As important for NLM, the area had the requisite infrastructure. It was worth the trek. “They were impressed, and they knew we were serious when we traveled that far to see them,” said Gaines. Kotzebue Middle High School was added in 2007. The technology in place turned out to be problematic initially, causing a slight connectivity delay, and speakers talked over one another. The Alaskan school district’s Internet provider stepped in and provided free services, which eliminated the delay. Following these early successes, Gaines and Locatis were eager to add more schools. Based on connections, they contacted the Governor Wallace Rider Farrington High School in Honolulu in 2009 and the University High School in San Juan, Puerto Rico in 2014. More schools gave students more opportunities to learn from each other about how geography affects health. Consider global warming. That’s just what the program was designed to accomplish. But then there are the extras. July 14, 2016 in Programs & Services. ← The Road to Reproducible Biomedical Research?